at Salie Gym, Forward Operating Base Warhorse, Nov. 27. 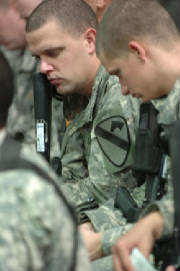 BAQUBAH, Iraq (Nov. 27, 2006)) -- "At times like these, it is important to remember that Staff Sgt. Morris was not ours to keep. 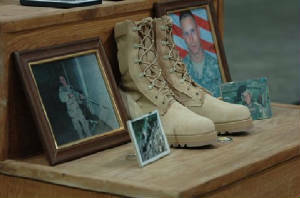 Rather, he was called home ahead of all of us to a better place," said Capt. 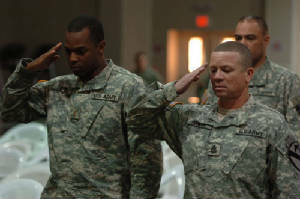 Clayton Combs, commander of Company C, 1-12 Combined Arms Battalion, 3rd Brigade Combat Team, 1st Cavalry Division, during a memorial service to honor Staff Sgt. Daniel Morris, Co. A, 1-12 CAB, and a native of Clinton, Tenn. Morris died Nov. 25, of wounds received in combat near Baqubah, Iraq. 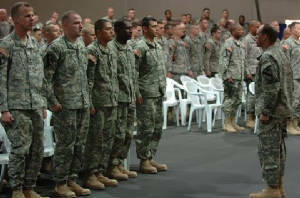 Soldiers from the “Grey Wolf” Brigade, many from the 1-12 “Charger” Battalion, gathered to honor the life and service of Morris during a ceremony at Forward Operating Base Warhorse’s Salie Gym, Nov. 27. Chaplain (Capt.) Eric Bey led the invocation and prayer while Soldiers spoke about their fondest memories of the fallen Soldier. "The one thing everyone knew about [Morris] was how strong his faith was, and how solid his character was," Combs said. "Staff Sgt. Morris was a great Christian," said Capt. Christopher Conley, commander for Co. A, 1-12 CAB. "He believed in the Lord, Jesus Christ, as his Lord and Savior," he continued. "He is currently in heaven, enjoying his eternal life. His walk with the Lord was well known, and as a result, his moral courage was unparallel." "Staff Sgt. Morris used his faith to draw strength in competence," Conley said. "He knew that no matter what happened to him, he was going to be saved. Just like the men Joshua led into combat -- he let the lord guide him and his life." "Staff Sgt. Morris was a great man," said Conley. "He always treated everybody with dignity and respect. Put that together with his leadership, and he's the exact Soldier we want fighting in this Army, fighting the war on terror. I wish I had ten more Staff Sgt. Morris'." "He was a good man, he loved his guys and loved his job," said Sgt. 1st Class Michael Davenport as tears filled his eyes. "He was a man of his word," added Davenport, one of Morris’ battle buddies from Co. A, 1-12 CAB. "If Staff Sgt. Morris told you something, it was true," Davenport continued. "If he told you that you could depend on him, than he was the man you could depend on." "His word was his bond," added Combs. "He walked the walk of a true Soldier as a source and example for those around him. 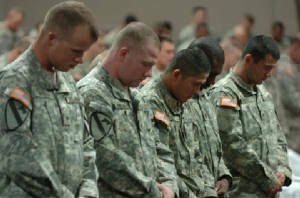 The truth is he loved his Soldiers and never once let them down." "Staff Sgt. Morris was loyal to his men and his unit and to God," Davenport said. "He did what was in his abilities to stay true to his religion that he loved so much. He also cared for his Soldiers, ensuring them their problems were his problems." "I know today, in my heart and soul, that he is in a better place, standing with God in heaven," he said. "Staff Sgt. Morris will be missed. A brother has passed, but we will never forget." "It is our comfort to know that such a fine man is surely in heaven today,” Combs. "His men knew that he carried his Bible with him on every mission. Whenever he was in a tough situation, he would just put his hand on that good book. It gives me comfort to know that his source of strength and devotion was right next to him until the very end." "And right before he left this world, he wanted everyone to know he cared," added Conley. "And he wanted to make sure his Bible, the one he cherished so dearly and went on every patrol with him, made it back to his father." "Staff Sgt. Morris gave us a task: return his Bible to his father," said Lt. Col. Morris Goins, commander of the 1-12 “Charger” Battalion. "This was his request," said Goins. "Staff Sgt. Morris, we have accomplished our mission." "We all feel the pain and loss of such a high caliber of a person in a world that needs strong men to stand up and shoulder that heavy load," said Combs. "Staff Sgt. Morris was one of those men, and his absence will be missed by all." "Hero, Soldier, Christian, Friend -- Staff Sgt. Morris, you will be missed but not forgotten," he said. 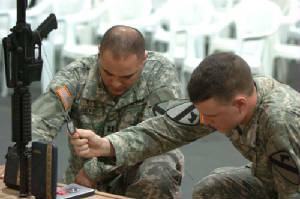 SPC DeTeso is on the left; SGT Miller is next to him. and the 1st Cavalry Website.